Transportation America, a coalition of housing, business, environmental, public health, transportation, equitable development, and other organizations, has published a report on the dangers faced by pedestrians in the US. According to the study, while motor vehicle fatalities have gone down over the last several years, pedestrian death rates have fallen only marginally and, in some of the most dangerous cities, have actually risen. Transportation America attributes the decrease in motor vehicle deaths to stronger laws, greater seat belt use, and efforts to reduce drunken and distracted driving but, according to the study, pedestrian safety has received very little attention from traffic safety and transportations experts at the state and federal level. The study states that steps are not being taken to provide sidewalks and other safety measures for pedestrian traffic. According to the report, pedestrians make up nearly 12 percent of total traffic deaths. The study's authors state; "These deaths typically are labeled "accidents," and attributed to error on the part of motorist or pedestrian. In fact, however, the majority of these deaths share a common thread: they occurred along "arterial" roadways that were dangerous by design, streets engineered for speeding traffic with little or no provision for people on foot, in wheelchairs or on bicycles." Using data on pedestrian deaths over the previous ten years and census data on walking, the study's authors created a Pedestrian Danger Index (PDI) to rank America's cities according to their risk to walkers. 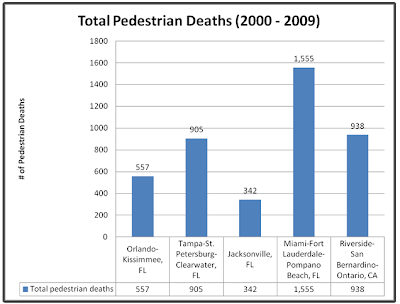 In Florida in 2009, more pedestrians were killed (466) than passengers in motor vehicles (453). Remember, pedestrians in crosswalks always have the right-of-way. Even if you have the green light, you must wait for pedestrians to clear the crosswalk. Be on the lookout for motorized wheelchairs on the road. With no sidewalks, a person in a wheelchair has nowhere else to go. Blind pedestrians with a white cane or a guide dog always have the right-of-way. All traffic in both directions must stop when a blind person is crossing the road. When driving, be on the lookout for pedestrians, especially around shopping areas, schools, and playgrounds. Don't assume that, because the pedestrian looks at you, that they won't step out into the road. The pedestrian may be assuming that you will stop.